Commonwealth bank had until recently only a phone app for its banking system ignoring its vast user base of customers using android smartphones. Commonwealth Bank (CBA) customers using Android smartphones now have the opportunity to access their bank statements and balances at their fingertips with the “NetBank mobile banking app”. While CBA launched the NetBank app for iPhones two years ago, the bank now has updated the application for Google Android Smartphone’s to include customised screen sizes and resolution, along with faster processing times. 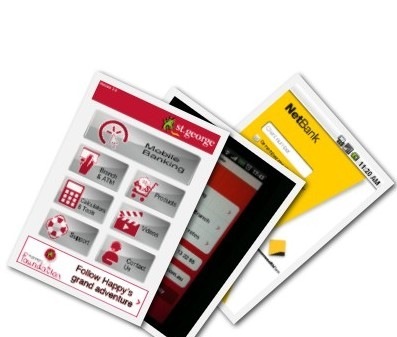 Commonwealth Bank also built in a innovative feature “Remember Client” option to speed up the logon process for NetBank Mobile customers. Currently Westpac is only supporting Iphone users with a iphone app . check this link http://www.westpac.com.au/personal-banking/westpac-online/mobile-faq/#1_which_mobile_phones_are_supported . St. George, on the other hand, has a dedicated Android application , but It’s hardly an app though as it just takes you to their mobile banking website. ANZ has released an iPhone application that allows customers to send money to anyone with an Australian bank account using only their mobile phone number as an identifier. ANZ has released an iPhone application that allows customers to send money to anyone with an Australian bank account using only their mobile phone number as an identifier. NAB now has a dedicated Android application under its own brand name. It’s a free application readily found in the Android marketplace. The app allows for account balance checks, funds transfers, bill payments and access to NAB Online Trading portfolios. There’s also inbuilt functionality to find the nearest ATM and check foreign exchange rates.